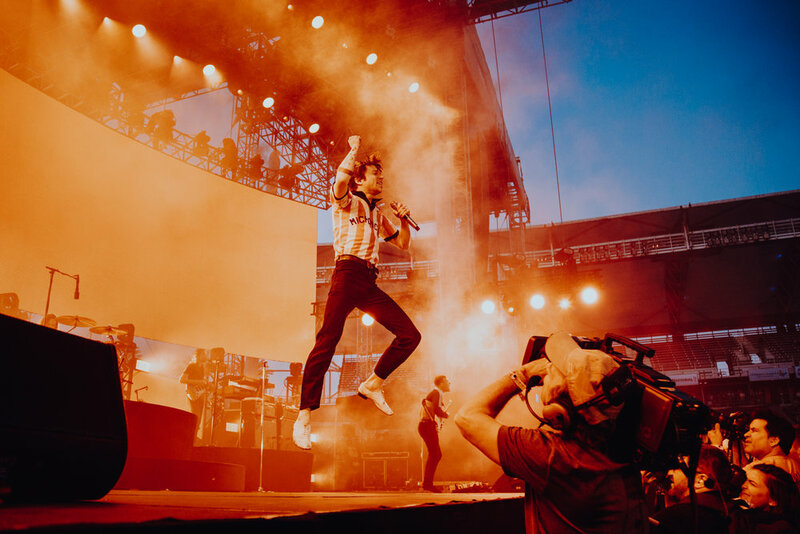 Blended’s Brooke Bell sat down with three female concert photographers to discuss their artistic journeys thus far and goals for the future. Each photographer is at a different point in their journey, having worked at various levels within live music photography. As women, Sophia Ragomo, Paige Sara, and Brittany O’Brien have all faced challenges that come with succeeding in a male-dominated industry, such as going on tour. Read below to learn about 21-year-old photographer Paige Sara and her unique experiences. Where did your interest in photography start? I started taking photos around the age of 12 on a small pink compact digital camera. I was taking a lot of nature photos on family vacations or in my mother’s rose garden, whenever or wherever I could for fun. When I got to high school they had photography classes where I learned to develop film by hand and I kept at it. I got pretty serious around 15 or 16 and knew it was something I was going to pursue. How did you get your first job and how old were you? I don’t remember my first paid photography job. I quit my retail job and started working for a wedding photographer when I was 17, so maybe then. The people I meet and the art we all make. What equipment do you bring to shoot at shows? Canon 5D Mark IV, 50mm lens, 85mm lens, 24-105mm lens. Extra batteries, cards, and flash depending on venue or if shooting BTS portraits. How do you post process? Here’s a brief look at the process: upload everything to Lightroom, weed out and delete the bad shots, edit the good shots, export and upload to Dropbox. What was your favorite tour experience and why? I haven’t done extensive touring yet, but I lived in a house with Barns Courtney for a month last year in Carmel, CA when he was writing his new album. We got into a lot of trouble, like we fell into the ocean with all my camera gear on the second day there. The third day, he crashed a golf cart into a fountain and broke a water line. When I came to help I ended up getting electrocuted– like really electrocuted– a few times. Does that count? Music and fashion are my main influences. I’m really keen on 60’s and 70’s rock n’ roll culture. The music, the lifestyle, the fashion… it’s all wildly excessive and enticing. I’ve found a lot of inspiration in the art from that time. I should add that there are current fashion houses and artists that have acted as muses to me as well. I created an entire photography collection inspired by The 1975’s debut album in 2014, so it’s safe to say that any music I can connect to sparks a creativity in me that didn’t exist beforehand. Who is your dream artist to work with? I’ve got a bunch but I think I really have shot with Kasey Musgraves in a dream. But I would love to tour with someone in rock like Greta Van Fleet. Their live shows give me chills, it would be a dream to get to experience that every night. Harry Styles…anyone whose music I love. What would you be doing if you weren’t a photographer? I’d be fronting a band. Do you feel any setbacks in this job or whole industry as a woman? It can be a boys’ club for sure. There are all-male bands and all-male crews who sometimes want to keep it that way. As a woman, you’ve got to fight to get where you want to be and I feel like I’m constantly proving myself. Plus there’s the whole “groupie” stigma. That’s another issue in and of itself for two reasons; one being the nature of women on crew is almost always purely professional NOT romantic and anyone calling them a groupie is oblivious, and second, the stigma around the word “groupie” which is essentially just a liberated woman who hangs around bands sometimes. Why do people scoff at that so much, ya know? Are there any challenges on tour as a woman? What are they? Aside from anything I talked about before, I’m not sure. I personally have never been on the only woman on a tour before, so I think someone in that scenario may be able to explain that better. What is your advice for future concert photographers? Keep at it, and don’t work forever for free! Sara has an extensive photography background with an array of genres. She has worked closely with iconic artists like The All-American Rejects and Barns Courtney while getting the opportunity to shoot Harry Styles, Billie Eilish, and The 1975 — just to name a few. Take a deeper look into Sara’s impressive background and style by checking out her site here.